Former world champion Nathan Cleverly says he will only fight elite boxers for the rest of his career. The Welshman, 28, has lost three of his last six fights but still has ambitions of becoming world champion again. Cleverly was accused of avoiding the best light-heavyweights during his three-year reign as WBO champion before losing to Sergey Kovalev in 2013. "Every fight now till the end of my career, until I hang the gloves up I'll go to war," Cleverly said. "Real fights against elite fighters, world title belts or top level fighters on the big stage, only those now till the end of my career." Cleverly concedes that the fight against Kovalev and the loss to Pole Andrzej Fonfara in October this year were a step-up in class to previous opponents. He moved up a division after losing his title to Kovalev two years ago. 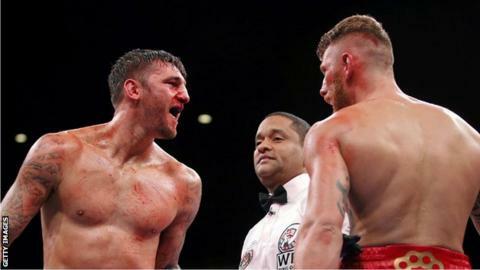 The Welshman considered retiring after losing to English cruiserweight Tony Bellew in November 2014, yet returned to light-heavyweight for a "fresh assault" on the division. That resulted in a points defeat against Fonfara in a WBC International light heavyweight title bout. "I could happily have stayed unbeaten against fringe contenders," he added. "But I tested myself against Kovalev, who is probably the best pound-for-pound fighter on the planet. "Obviously I lost my last fight, but again Fonfara is an elite level fighter." Although Cleverly says retirement is not an option, he concedes that he is concerned about the effect on his health. "There's a large element of me which says you don't want many of those fights," he said. "They're brutal, your nose is broken, your face is swollen and you can feel the swelling around your brain. "You definitely don't want too many of them but I'm prepared to do it again." The Welshman is hoping to speak to his promoter Eddie Hearn over the next few weeks with a view to setting up a bout with Germany WBA light-heavyweight champion Juergen Braehmer.